This guide is for those interested in learning how to build a basic web scraper that can download and parse html pages. The viewer is expected to have an understanding of tools like java and an IDE. The following guides were performed only on my own website please note it is a offence to perform on anyone else website. 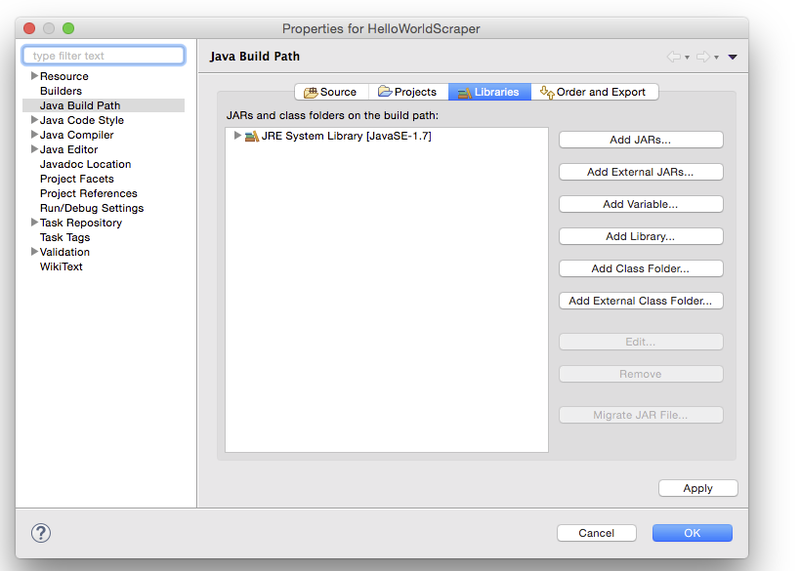 The tools I am using is java jdk 1.7.0_79, Eclipse Mars and Lastly Jsoup.jar(Library to parse html documents). Open up the IDE and select the file menu option and then new Java Project. Once we have downloaded the Jsoup library we need to add it as a dependency to the build path. 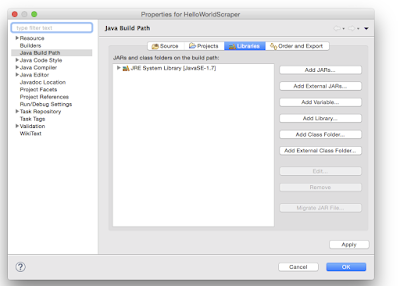 Right click on project folder and select the build path option then configure build path. Make sure the view opened is open in the library tab and not the others. 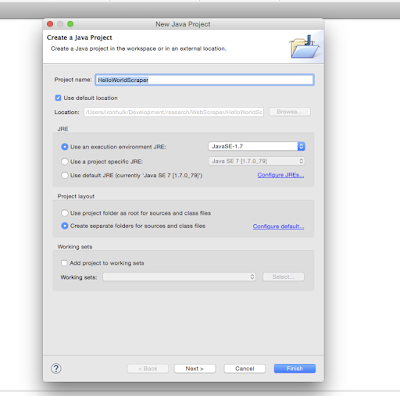 Select the option to add a external jar, once the dialog opens find the jar you download and click ok.
method in your class. This will be the start point. The tutorial is very basic usage of Jsoup and scraping the web, however it can be scaled up quite a bit by incorporating threads and a database and some more code. This is a fun how to guide. 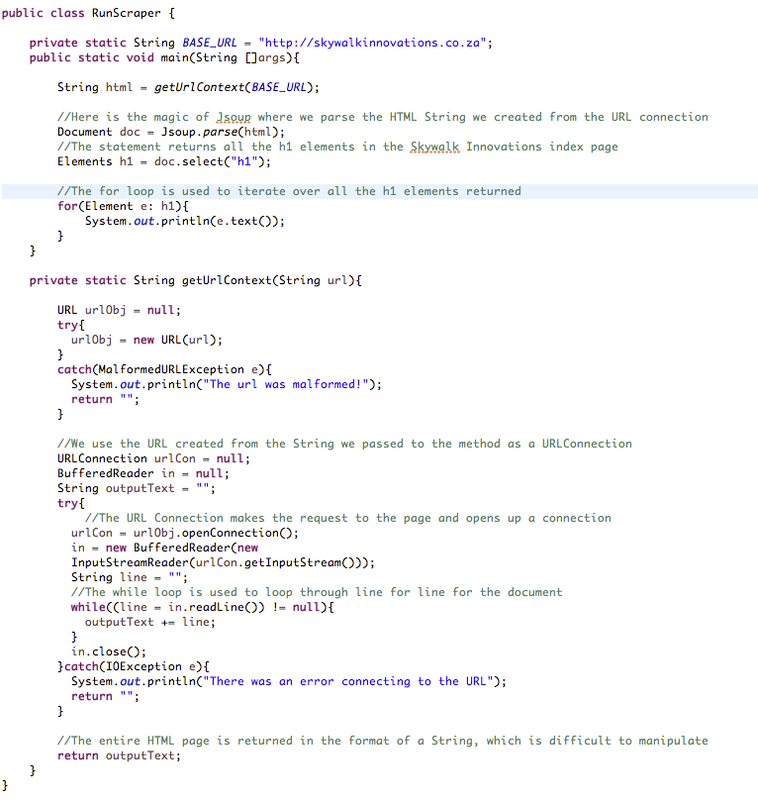 I have always wanted to see what certain applications look like under the hood. ADB as Google's definition is a versatile command line tool that lets you communicate with an emulator instance or connected Android-powered device. So know that we know what ADB is time for fun. The following guides were performed only on my own application please note it is a offence to perform on anyone else code. This guide assumes you have the android sdk downloaded and installed. Once completed installation plug android device in and open a terminal. 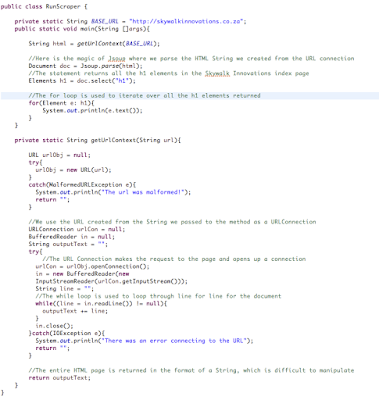 That's it you should now be able to view any source code, however if the application you've decompiled is using proguard the code will be obfuscated and you will need to remap the classes on your own. @Skywalk Innovations . Awesome Inc. theme. Powered by Blogger.